We try to inform the best we can about the care of pigs so you can make a good decision on whether a pig is the right pet for you. They are definitely not the pet for everyone and can NEVER live in an apartment or condo with no yard. The care is different than for a dog and they do need a lot of attention and time. Do not buy a pig in impulse or for a present for someone, they are an exotic pet that requires patience and research. Please get books (see link at bottom) about them and be well informed before coming to see the pigs so you know what to expect. Advantages: Long Life Span (12-18 +yrs), Clean and Odor Free, Non-allergenic in most cases, no fleas, low shedding, easy to train, no barking, low maintenance, affectionate, clean, highly intelligent (4th smartest animal in world)- easily trained for litterbox, tricks, harness and more! Diet: It is easy for a pig to get fat, they are pigs! Especially a pig of this size that remains very small. If your pig is developing rolls around the face and you have a hard time feeling the hip bones, your pig is getting obese and should be fed less. On the other hand if your pig feels skinny then it needs more feed. The feed I use is Conway feed which is only available at their mill in mount vernon. I recommend Purina Pig and Sow but you can also get Mazuri mini pig active adult (do not get the youth one for babies, makes them fat) both are at most feed stores in the US, please get this before your pig goes home in case your store needs to order it for you. Another website for pig supplies is www.healthypigs.com which has an amazing selection of skin/hair products, shampoos, vitamins, harnesses and more. As well as having pig food daily, they also need to be supplemented with some fresh vegetables that should be about 25% of their diet- do not need veggies daily just few times a week. Things such as cucumbers, celery, peppers, carrots, potatoes, broccoli, cabbage, frozen peas, eggplant, squash and green beans are good choices (but try to limit starchy veggies like potatoes). Some fruits like peaches, apples, pears and plums can be fed as well but in moderation due to the high sugar content. Most pigs love treats like apples, grapes (cut in half) and raisins but these are good to be used as treats and reserved for training purposes. Do not feed your pig dog and cat food, it is much too high in protein and salt for them. Also do not feed them chocolate or salty things. They love plain air popped popcorn as a treat, just no salt and also raw unsalted peanuts are a good training treat as well as frozen peas and unsalted rice cakes. I feed mine orchard grass hay and local grass hay for bedding and they eat it/love it but it is messy in the house so as a snack outside maybe for a house pig or in their outside pen/house. Hay is much less fat than grass in the yard, keeps them full without getting too fat. Vitamins: The northwest soil lacks minerals so you need to feed vitamins to your pig. They especially need selenium and Vitamin E. I feed a supplement called "horse guard" which is for horses and dose is 1 tablespoon a week. Pigs should be allowed the opportunity to root in soil and graze on grass (not treated with chemicals). 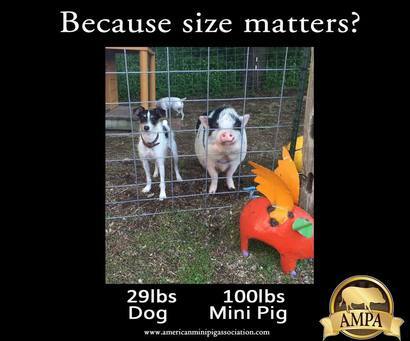 Even if it is a 10x10 area fenced in your yard just for the pig to dig up, they will love it! Also can put dirt in a kiddie pool for them to play in. They cannot live in a 10X10 area, that is just for them to play in dirt. Make sure your pig always has fresh water available. They love their water and I often have two bowls for mine since they go through it so fast. Care: They are pretty easy to care for but need some maintenance. They should be bathed every so often to clean their skin but not more than twice a month as it dries them out. You can do this in a kid pool in the summertime or in a tub in the winter. You need to work fast in the tub as they do not like them much and usually scream..;) you can use dog or baby shampoo on them diluted in spray bottle so its easier to apply. For their dry skin you can put Avon Skin-So-Soft Lotion on them daily or weekly, can also use baby lotion. Their ears may become crusty and this is somewhat normal as their skin by their ears and neck does get flaky. You can clean inside them with a washcloth and lightly scrub them if they allow. Q-tips should not be used! You can put a washcloth on your finger and go in ear a bit and wipe around, just put ear cleaner on washcloth or light soap. If their skin becomes red, bloody or flaky white skin, please contact me or a vet. They will need to be treated with ivermectin wormer and maybe some medicine, mange or mites can also be on their skin and it does need to be treated. Their hooves do not grow too fast but they may need to be trimmed every now and then. Just check to make sure they are not getting too long on the edges and if they need trimming use some sharp garden shears to trim the hoof edges, there is info online about this as well. I make sure mine walk on gravel or concrete to keep hooves short. Make sure your pig has enough exercise. They should be able to run daily either in a large room inside or out in the yard. They need to burn off energy. You can also play with them to get them exercise or have them learn tricks to keep their mind occupied. We do offer boarding when you are on vacation as well as some other pig services, see tab above under pig vets/resources for more information. All baby boys go home already neutered as an unfixed male pig makes the worst pet ever as they have a musky odor, are aggressive and grow tusks. Females will go home unspayed with contract to be spayed when older, depending on price of your pig, some spays will be included in price where you take them to my vet to be spayed when older and some you will need to pay for yourself to be spayed. Females should always be fixed as well because they go into heat every 21 days, can be moody and not use litterbox during that time and have a higher risk for cancer. Bedding: Pigs love to sleep! And nothing is better to them than a nice clean bed. Mine love soft fleece blankets. Sleeping bags are ok if opened but they can get stuck in them if left closed. They love to burrow under the blankets and sleep. Be sure to wash your pigs bed every week or so, your pig will love it!